Donald Trump has his 2020 re-election campaign well underway, with $106 million already raised for the effort by last October, according to the Washington Post, giving him a significant head start over any of the Democrats in the potential field. But according to a new poll, it is Trump who has a huge hill to climb if he wants to win a second four-year term in the White House. According to the ABC News/Washington Post poll released on Tuesday morning, 56 percent of Americans — nearly six out of 10 — now say that they refuse to even consider voting for Trump in 2020. At the same time fewer than three of 10, 28 percent, say that they will “definitely” vote for Trump. Trump won an Electoral College victory in the 2016 presidential election by claiming just 46.4 of the vote, according to CNN, actually losing the popular vote to Democrat Hillary Clinton by a margin of 2.1 points. But if the new poll were to reflect the results of the 2020 election, Trump would likely be unable to take the Electoral College again with 56 percent of voters rejecting him. The news from the poll was not necessarily rosy for Democrats either, however, according to an ABC News report on the poll, largely due to the expansive field of candidates in the race or soon likely to enter it. Among those current or expected Democratic candidates, none were able to garner even 10 percent of Democratic voters saying that they would “definitely” support her or him. Former Vice President Joe Biden leads the field, per the poll, with 9 percent saying that they would vote for him. California Senator Kamala Harris, the latest candidate to officially enter the Democratic field, came in next with 8 percent saying that they would “definitely” vote for her. Third in line is Vermont Senator Bernie Sanders, who is expected to soon announce his candidacy, according to his hometown newspaper the Burlington Free Press. But Sanders has only 4 percent saying that they will definitely vote for him. 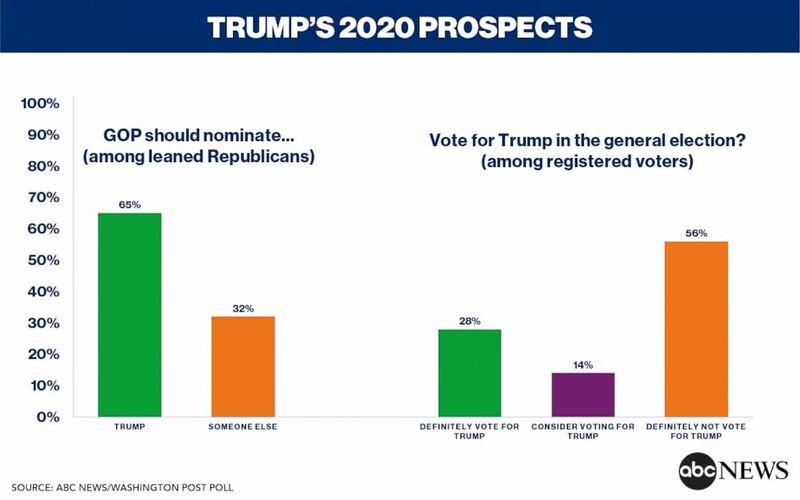 Among Republicans or Republican-leaning unaffiliated voters, according to the ABC/WaPo poll, nearly one third — 32 percent — say that Trump should not even be the 2020 party nominee. On the other hand, 65 percent say that Trump should win the nomination. Trump’s overall approval rating remains at near-record lows but has ticked slightly upward since the end of the government shutdown on Friday, from a low of 39.3 percent approval in polls that include results through Friday to 39.8 percent as of Tuesday, according to the average of all approval rating polls compiled by FiveThirtyEight.com.